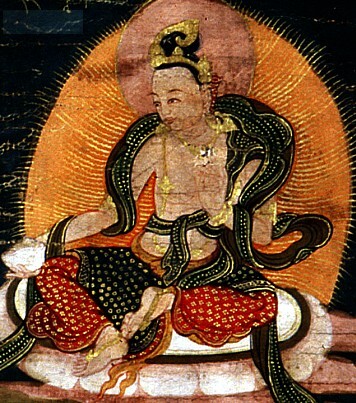 Khandro Nyingtik (Tib. མཁའ་འགྲོ་སྙིང་ཐིག, Wyl. mkha' 'gro snying thig), 'The Heart Essence of the Dakinis' — one of the 'Four Sections of Nyingtik' (Nyingtik Yabshyi). The Khandro Nyingtik cycle of teachings is regarded as one of the main practices of Dzogchen Monastery. It was from Shri Singha that the great master Padmasambhava received the teachings of Nyingtik. In Tibet, Padmasambhava taught his own complete Nyingtik cycle of the Clear Light teaching of Dzogpachenpo in secret to Yeshe Tsogyal, along with 100,000 wisdom dakinis, at the Shyotö Ti Dro cave. Then one day, King Trisong Detsen’s daughter, the Princess Pema Sel, died unexpectedly at the age of only eight. The king was distraught with grief, and so to console him, Guru Rinpoche drew a syllable NRI over the little princess’s heart, caught her consciousness with the hook of his samadhi, and brought her back to life. As soon as she opened her eyes and could speak again, he gave her the whole cycle of the Khandro Nyingtik by means of the power he had to transfer blessings directly. He empowered Princess Pema Sel to reveal this teaching in a future life, and then the complete Khandro Nyingtik cycle was hidden as a terma. Princess Pema Sel was reborn much later as Pema Lédrel Tsal, who withdrew the terma of Khandro Nyingtik from its place of concealment at the Daklha Tramo Drak rock in the province of Dakpo. He then transmitted it to his main disciple Gyalsé Lekden. Pema Lédrel Tsal was reincarnated as the Omniscient Longchenpa, who received the whole cycle of Khandro Nyingtik from Gyalsé Lekden, and by so doing, ensured that the authentic lineage was kept alive. According to the Khandro Nyingtik then, the Mind Direct Transmission of the Buddhas is the same primordial expression of the Dzogchen teachings in the Akanishtha heaven. The Sign Transmission of the Vidyadharas is that which passed from Vajrapani to Garab Dorje, Shri Singha, Guru Rinpoche, Yeshe Tsogyal and Princess Pema Sel. From Pema Lédrel Tsal on, to Gyalsé Lekden and the Omniscient Longchen Rabjam, is the Oral Transmission from Special Individuals. The Khandro Nyingtik cycle itself consists of the Twelve ‘mother’ and ‘child’ Tantras of the Takdrol Gyü, the ‘Three Last Testaments of the Buddha’, and other teachings amounting to a total of sixty-five different categories. When the pith instructions are given according to the Khandro Nyingtik, it is these Twelve Tantras of the Takdrol Gyü and Three Last Testaments which are quoted as references. Guru Rinpoche’s Khandro Nyingtik came to be known as the ‘new’ Nyingtik, and is classified as terma. As it was first taught to Yeshe Tsogyal and Pema Sel, who were both dakinis, and the guardian of the teaching was the protectress Shaza Khamoché, it was given the name ‘Khandro’ Nyingtik. Guru Rinpoche’s Khandro Nyingtik is called the ‘mother text’, as is the Vima Nyingtik, and so these two are known as the two ‘mothers’. Nyoshul Khenpo, A Marvelous Garland of Rare Gems: Biographies of Masters of Awareness in the Dzogchen Lineage (Junction City: Padma Publications, 2005), pages 69-75. Third Dzogchen Rinpoche, Great Perfection: Outer and Inner Preliminaries, translated by Cortland Dahl (Ithaca: Snow Lion, 2008). Tulku Thondup, Masters of Meditation and Miracles, edited by Harold Talbott (Boston: Shambhala, 1996), pages 33-37. The Life of Shabkar: The Autobiography of a Tibetan Yogin, translated by Matthieu Ricard (Ithaca: Snow Lion Publications, 2001), pages 560-561, the 'Khandro Nyingtik Lineage' from Kuntuzangpo to Shabkar. This page was last edited on 2 September 2018, at 12:58.